Mummy Ate Me: Better than the book? Today, for the first time ever, I saw a movie that I though did justice to the book that it was based on. 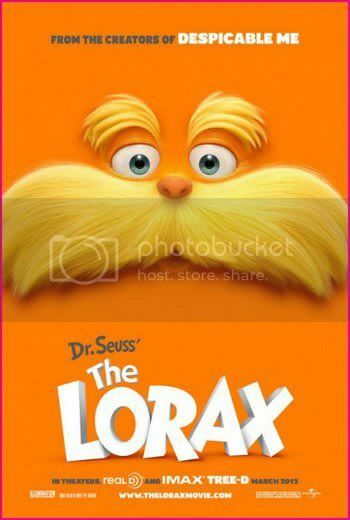 The movie was The Lorax and it is amazing - moving, thoughtful, hilarious and true to the book without feeling the need to follow it exactly. This was Wild Man's first trip to the movies and The Lorax could well be the book that he has had read to him the most often in his life so, as you can imagine, our expectations were pretty high and I was frankly worried that the movie couldn't possibly meet them. But it really did! I think the problem with movies based on books is that, if you have really loved a book and been engaged with its story, you have pictured every moment in your mind. No movie can live up to that, no actor or set will look exactly like your mental picture and books are generally longer then movies so some parts have to be cut out and you are inevitably disappointed. Perhaps that was the strength of The Lorax. The book is quite short, only 36 pages, and it is written entirely in verse so the creators of the movie had to take the book as their basis and then imagine a story around it. And they did a great job. The story was much more complex than the book but the original tale was at the heart of every scene and I'm sure Dr Seuss would have been delighted with the end result. The film is really true to the book's environmental message (Dr Seuss was surely before his time on that one) and the ending moved me to tears. There were a couple of times in the middle where Wild Man did start to fidget (but he is only 3) but for the most part he was enthralled and his first words when the film finished were "can we watch that again". Definitely go - the whole family will love this one!